Canadians aren’t the best at being active. Just ask Statistics Canada, who found in 2016 that only 1 in 10 adults were meeting the recommended 150 minutes of moderate-to-vigorous physical activity each week. Side-to-side stretching — Ease your workout recovery with these simple stretches. Stand with your feet hip-width apart. Raise your left hand up and over your head and keep your right hand down by your side. Bend at your waist and reach with your right hand towards the floor. Hold for 10 seconds and repeat on the left side. Squats — Let your inner beast roar with some good ol’ fashioned squats. Stand straight with your back up against the wall. Slowly lower your body until your knees are at 90 degrees and hold for 15 seconds. The longer you hold, the more intense the wall squat becomes. Shadow boxing — Mix hooks, jabs, and crosses for 2 to 3 minutes straight, then rest for 30 seconds. Go for as many rounds as you can up to 10 rounds. 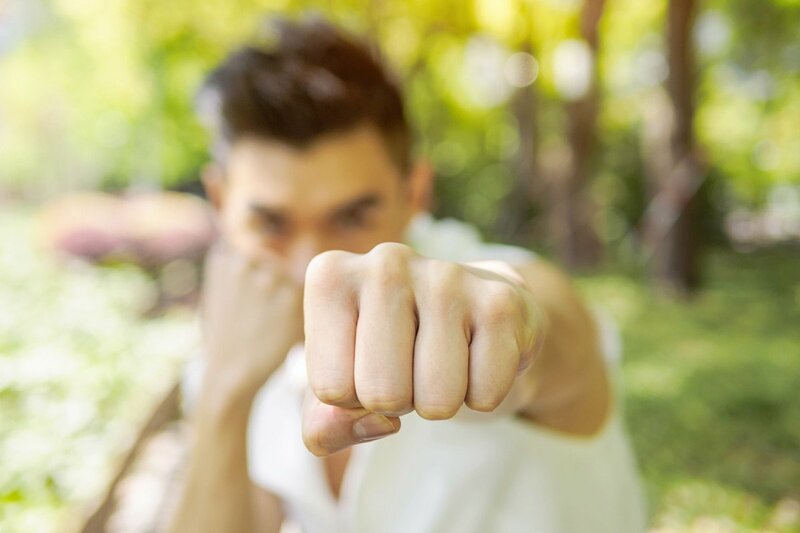 If you like the thrill of punching into the air, create a shadow boxing workout.